Modesty isn’t what I’d describe as a universal religious issue. When modesty is being couched in religious terms, it almost always is from our more conservative members. I think there’s the misperception by many in our culture, including in the Christian community, that calls for modesty are either a) attempts to inhibit freedom of expression b) sexism/patriarchalism c) both. I attended a Christian school for three years. There was a dress code for boys and for girls. I still remember one of my male teachers telling me and the other girls in my class how we had a “responsibility” to dress modestly so as “not to cause [our] Christian brothers to sin”. All us girls also were held back one day after an assembly and were reminded about our need to dress modestly and how it distracted the boys while they were in class. Overall, the message about modesty was that we girls needed to dress modestly because of the boys. That is, so often, the message about modesty that seems to come through. Very rarely do Christians focus on the benefits of modest dress for girls and feminists seem to oppose modesty on the very basis that it so often seems to be about the boys and therefore must be something we should get over. I prefer to dress modestly and to cover myself and I do this for several reasons. How we dress is part of how others form perceptions, whether we prefer it or not. It comforts me to know that I’ve mitigated, as much as I can, someone looking at me in an uncomfortable or inappropriate way. I like to know that I portray an image of maturity and moderation. While it’s sad that people are judged based on their dress, it is a fact. I find that when I’m dressed modestly, it’s not simply that others take me seriously, I take myself more seriously. I find that in modest dress I am more comfortable with myself. I have more confidence and am more self-assured than I would be otherwise. Living as a girl in modern America, we are constantly assaulted by advertisements and marketers. One cannot even walk in the mall near my town without televisions showing more advertisements. Everyone, it seems, is telling girls who they should be, what they should wear, what they should look like. Everyone wants a piece of who girls are. Dressing modestly is my way of owning myself. In this advertisement-saturated society, it is my reminder that there is something in this world that belongs solely to me and cannot be taken away. It reminds me that I have a self, I am in control of that self, and that it is no one’s but mine. While I agree that in an ideal world, it wouldn’t matter what we wore and we would be free to choose our clothes simply by self-expression, we live in a world that is more complex in that. I am not trying to say that there is anything wrong with dressing less modestly, or that it is ever condonable when women are forced to dress modestly against their will, but I feel in America, feminists currently view modesty as selling out. I believe that it is an option that should be respected just as much as any other choice of dress, and should be seen not as a symbol of oppression but a reclaimed tool of self-empowerment. Disclaimer: This is not my photo. I downloaded this from a friend’s wall who had shared it from their friend’s wall. The photo was public. My main source of information was the caption beneath this picture. While I have not verified this, I have no reason to believe it’s not legitimate. This photo was reportedly taken from the protests that were taking place in Egypt, where police crackdowns were also occurring. 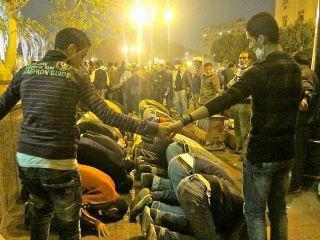 This is a picture of Muslims at the protest performing daily prayers, and Christians holding hands around them to protect the Muslims from the police violence while they wee praying. I think this is a powerful photo. With all people’s talk about the violence and divisiveness that pervades the Middle East, I think this photo underscores a poweful message. If this photo speaks to the future of the Middle East, then there is abundant cause for hope. It nearly brought tears to my eyes with happiness. I will admit that later, I experienced a bit of sadness when I thought about the poem, realizing that in many places in the United States, where we claim to be so open-minded and accepting as opposed to the rest of the world, I am not sure that this have happened, that many Christian Americans would have been so ready to protect Muslim Americans, and I pray in the future that may change and that we may take a lesson from this photo. We must protect and care for one another, no matter of what faith. What binds us together can be stronger than what divides. As Jesus has said, “Do unto others as you would have them do unto you”, we must protect others’ rights to worship, as we want ours to be. And most importantly: we are all Children of God.